Last night this power food was on my mind for some reason, so I wanted to feature it today. Okay let’s get back to the extreme health benefits that blueberries offer. Blueberries rank number 2 in the top berries. They have the highest antioxidants amongst all fruits, vegetables and seasonings. 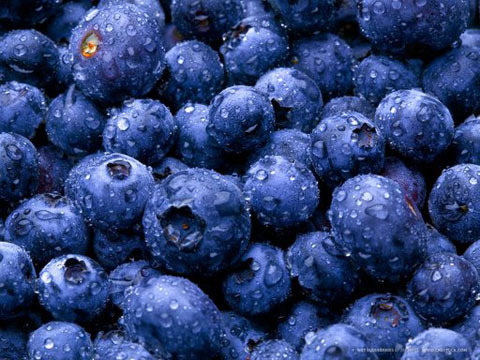 I recommend that you eat the blueberries raw, as you will be getting the most flavor and the greatest health benefits. What are some of the health benefits blueberries offer-? Just recently a study shows that blueberries can improve the memory. They did a study with older adults, ages ranging between 75-80 years old and this was a 12 week program. Within the last few weeks, studies were shown that when they consumed these blueberries, they noticed that their memory was improving. Each participant was given between 2 2/12 cups of blueberry juice daily. How interesting right? Did you know that you can freeze blueberries, and you will not damage the antioxidants? So if you were wondering, well can you freeze blueberries, and still get the same amount of antioxidants as fresh ones, yes you can. There you have it. I already had a bowl of cereal today with fresh blueberries. Why not try some fresh blueberries over yogurt, or in a dessert crepe. Yum!